Located just two miles from the City Centre, Hockley Port is one of the Canal & River Trust's premium residential mooring sites in Birmingham. The site is within the confines of the old Hockley Transhipment Warehouse and provides a full range of on-site facilities to customers. The moorings are separated into three areas, two basins and the main arm off the Birmingham Canal (Soho Branch). Space is provided for up to 33 vessels. The site can be accessed from Birmingham City Centre by turning into Western Road from the A41 Dudley Road, immediately before the City Hospital. Western Road leads into Crabtree Road. At the junction of All Saints Street and Pitsford Street turn left into the service road on the old warehouse site. The mooring site is at the end of the service road. There are two service buildings, one next to the basins, near the site entrance, which houses a laundry room, shower & toilet, Elsan disposal and a payphone. The second building is next to the main arm and houses toilets, showers & Elsan disposal. Drinking water is supplied by one stanchion per two boats. Electricity is supplied through bollards. These are fitted with smart meters that supply electricity by pre-payment. There are two clothes drying and wood storage areas, conveniently located for both main arm and basin moorings. 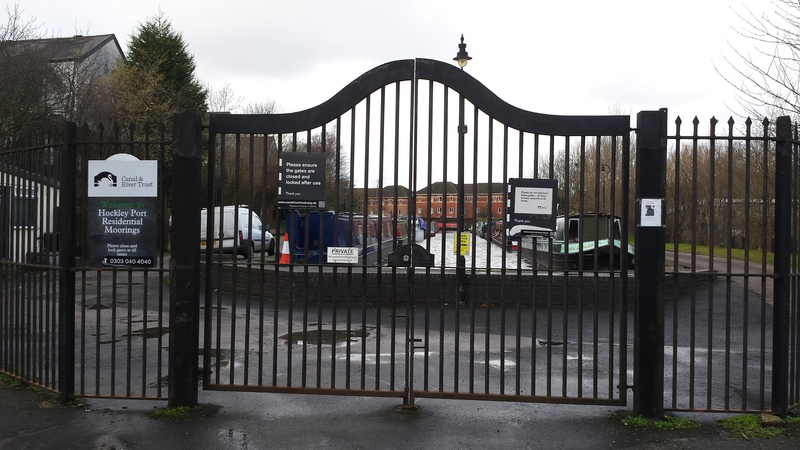 Car parking is within the site and the entrance gate is fitted with a padlock. A key is available to site residents for a refundable deposit of £50 pounds. Berth holders can purchase a key from Cambrian House in Birmingham. IMPORTANT NOTE: Council tax is applicable at this site and is payable to the local authority. It is the responsibility of the berth holder to contact them about their residential status at the moorings from the date the berth is accepted. By prior arrangement through the Mooring Manager as the access gate is fitted with a padlock.